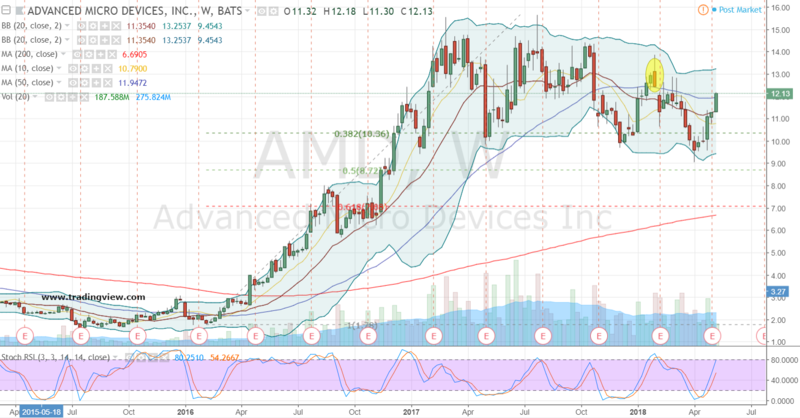 Support off and on the price chart of Advanced Micro Devices, Inc. (NASDAQ:AMD) is setting shares up for a breakout year in 2018. But for like-minded bulls, the price for entry in today’s market is free of cost using a smartly crafted and well-placed options spread instead of buying AMD stock. Let me explain. It has been a couple weeks since AMD stock announced mostly better-than-expected results for its first quarter and issued an above views sales outlook for 2018. Nevertheless, the report wasn’t perfect and there will be challenges ahead some of AMD’s markets. More importantly, the release continued to show strong execution under AMD’s CEO, solid overall revenue growth and reaffirmed the company’s turnaround is humming along. Despite the overall impressive results, AMD still maintains high — but easing — bearish short interest and an abundance of haters or Doubting Thomases, based on the comments section of the linked MarketWatch article. Oh well. I suppose you can’t please everyone. But where it matters most in those bottom, top and squiggly lines on and off the price chart, AMD stock has a lot for bulls to look forward too. In the three-plus months since writing optimistically about AMD stock’s prospects, conditions have become a good deal more complex for bulls. At the same time though, the technical landscape has also become increasingly easy to appreciate with a positive eye. Technically speaking, over this period shares of AMD foiled a rather bullish-looking high-level corrective double bottom or “W” base and pursued a lower high and low pattern. This development could be bearish as the added series of lower peaks and valleys does establish a classic downtrend. But that sour narrative is far from the end all, say all. Alternatively, the same bearish formation’s most recent lower low sets up a corrective high-level triple bottom base of about 1.5 years in duration which found support in-between the 38%-50% Fibonacci retracement levels. Personally, that pattern has more than just my vote. Bottom line, investors will have to decide for themselves how they chose to view AMD stock. But for this strategist, combined with what’s going on off the price chart, the corrective and beefy triple bottom is anticipated to trump the bear case and find AMD aggressively higher over the course of 2018 and beyond. Reviewing the AMD options board, one combination strategy that has caught my eye is selling a put spread to finance a bullishly-positioned long call butterfly which profits from a wide swath of above-market real estate. Specifically and with AMD stock at $12.13, selling the Aug $10/$9 put spread and buying the Aug $14/$16/$18 call butterfly is priced for even money. The primary objective of this combination is for shares to rally so a profit in-between $14 and $18 will be achieved. The sweet spot is if AMD lands at $16 at expiration. That kind of perfection would yield a profit of $2. The downside or in this instance, dueling risks with this strategy is if shares rally too strongly or crash lower. Regarding the bearish scenario, the trader has sold a $1-wide put spread for even money. Thus, there is $1 of risk below $9 in AMD stock. The good news is that’s 25% below the current market price and just below the April triple bottom low. In our view that’s an acceptable exposure to maintain. As for the latter determinedly bullish forecast, above $18 this position will collapse to $0, as both spreads go out worthless for a strategy which was put on for free. Having said that and speaking as an invested bull, I wouldn’t be overly worried. The reality is a rally of that magnitude is nearly 50% above the current price. And while I like and live by the long game in AMD stock, with just over three months of life for this attractive-looking and bullishly pragmatic spread, the opportunity for shorter-term profiteering looks equally strong. Investment accounts under Christopher Tyler’s management currently own positions in AMD stock and / or AMD derivatives, but no other securities mentioned in this article. The information offered is based upon Christopher Tyler’s observations and strictly intended for educational purposes only; the use of which is the responsibility of the individual. For additional market insights and related musings, follow Chris on Twitter @Options_CAT and StockTwits. Article printed from InvestorPlace Media, https://investorplace.com/2018/05/advanced-micro-devices-inc-sorry-bears-2018-is-a-breakout-year-for-amd-stock/.